Although I have been relishing the extra time I’ve been getting to relax, veg out, and just hang around with my family lately, it’s definitely time to get back to beading and all of the creative things I used to do once upon a time. Somewhere inside of me there’s a person who loves to create jewelry, photograph it, write about it and experiment with colors at every opportunity. I just have to figure out where she’s been hiding. In order to get back on track, I’ve got to find my creative grooves again – refresh and start new. There are quite a few methods that I’ve mapped out, including finally getting around to deciding on a new shop platform and filling it up with pieces from Ancient Worlds, Modern Beads. I think that starting there will help me figure out what I want to do with the rest of my inventory and get back on track shop-wise. In the meantime, I’m determined to start making again. To get my motivation and inspiration going, I’m going to try out some proven methods, only this time I’ll be doing them all in a heap, like a great creative detox. Phase one is almost complete. First I rolled up my sleeves and cleaned my workspace. Over the past few months, I’ve been a bit lazy about putting beads away, and filing things where they ought to go. My workspace also managed to accumulate a lot of unnecessary objects such as a DVD I meant to watch and forgot about, and a big bag full of little bead baggies that was just taking up too much space. Although it’s convenient to have them there whenever I need a place to put a recently cut strand or hank, it’s not worth it to have it cluttering up space that could be holding beads, or books, or nothing at all. I realized that the herringbone collar I was working on was dragging me down as much as anything else, so I’ve packed up the beads for now. 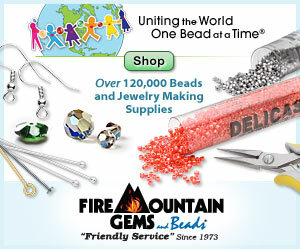 As soon as I get a chance to re-file all of the beads that had collected on my table, I’ll be ready to start fresh. Now my workspace has only the essentials: my tool jar, inspiration notebook and 7-year pen, my bag of culled beads and my beeswax. I left my collection of seed bead leftovers in the hopes that I’ll be inspired to use them. All that’s left is the paint and glitter stains that only sandpaper can remove! Phase Two will be even more cleansing and I'm really looking forward to getting started. How do you work through creative blocks? I have been a big neglectful of all my duties these past few weeks, both in beading and in blogging. Before we get around to an update on this week’s progress, let me say thanks for sticking with me so far! Although I had a little surge of ideas and projects, it turns out that I’m still a bit burnt out from making designs for Ancient Worlds, Modern Beads. It would also seem that taking on two projects at once wasn’t the great idea that I thought it would be. After stitching a few inches of the new herringbone collar that I started, I realized the repacking and unpacking of so many different bead types - all of which I need to have out at once - was just too time consuming, and I’ve been plodding along on the collar without picking up any other projects. The collar is coming along nicely, though I haven’t spent quite as much time on it as I should. I’ve been feeling a bit unmotivated of late, partly because I have no idea what to do with my pieces when they’re finished. Over the past several years, I’ve juggled both an Etsy and an ArtFire store, testing them both out to see which one suits me best. Because Etsy runs on temporary listing fees as well as a 3.5% commission, I decided that it was just too expensive and time consuming to list most of my work there. Just as I was getting into the process of moving and cultivating an ideal selection for both shops, ArtFire rolled out Google and Amazon ads on all listing pages. 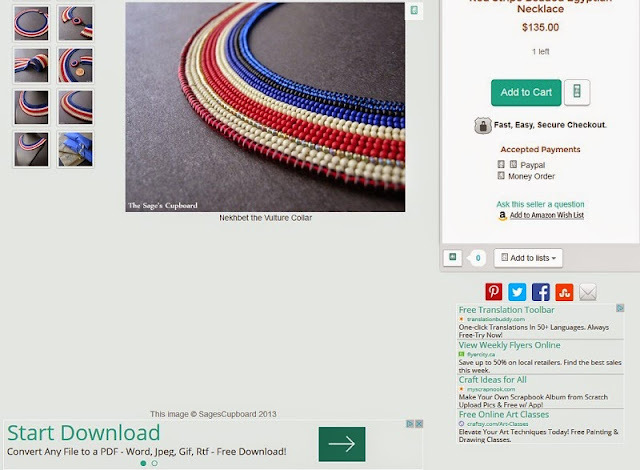 Although I’m not necessarily opposed to having third-party ads on pages I’m already paying for, the page design is really terrible, and sellers have no control of the quantity or types of ads that are displayed. The only way to opt out of the ads is to sign up for 3% commission fees - something that I’m not prepared to do for one-of-a-kind pieces that can sometimes be over $100. I'm working more than usual at the day job right now, which is fabulous; but I simply don’t have the time or energy to research and cultivate a shop on a new platform right now, so I’m feeling a little glum when it comes to making new pieces. I’m hoping that giving my workspace a really good tidy and refresh will help me at least get some of the beading bug back so that I can get back to making jewelry just for the joy of it. What are you making this week? Are there any challenges in your path right now? I’m a little behind on projects this week, as I’ve been catching up on sleep instead of staying up late to bead. It’s a bit of a double setback, as I’ve taken on the rare challenge of working two projects at once. The red bugle cuff that I had started last week was a bust. One of the seed bead colors that I had chosen didn’t work out – I was spending more time culling them than actually getting any beading done. Feeling discouraged, I decided to set aside the project for later and get started on another design that I had been pondering. I got to work on a new fringe necklace that would combine a black and gold striped rope with some striped Java glass and perhaps a few mother of pearl chips. Then I got a sudden craving to make a new all-seed bead herringbone collar. I started with some cactus green 8/o’s and built a nice palette from there. The beadwork hasn’t turned out quite right, so I’m going to need to restart, but I’m hoping to continue with it until the end.